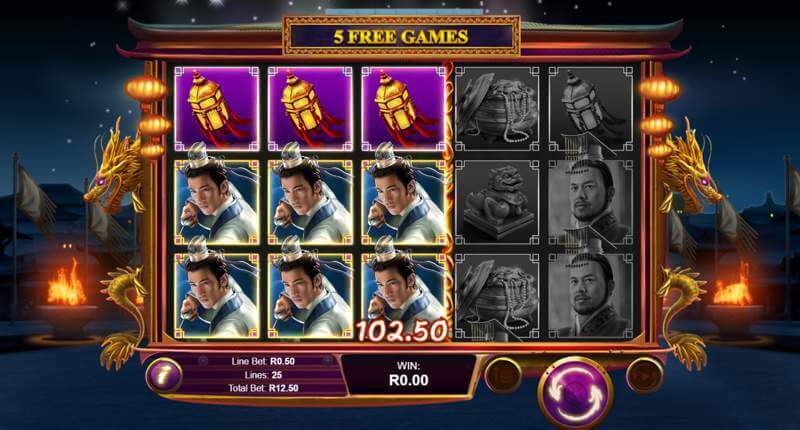 RealTime Gaming mines the historical riches of China’s Tang Dynasty to unearth the treasure that is Empress Wu Zetian. Containing wilds, free games and expanded symbols, Wu Zetian retells a beloved story while boasting maximum wins of x50,000 payline bet! The story of the only Chinese Empress in history coincides with the mighty military and political expansion of the Chinese Empire. Thus, it only fits that she makes up the highest-paying and of course most sought after symbol. The other high-paying symbols include the Emperor Taizong, son Emperor Gaozong, Chinese subjects and her steed who she called the Lion Stallion. Finally, a lovely jewel, jade Imperial guardian lion statue, golden treasure pot, lantern, rose and decorative comb makes up the lower-paying end. The artwork is beautifully illustrated with photo-real images, and the audio is serene and mesmerising as the wind can be seen and heard blowing the clouds and banners to the back of the reels. Enhancing the sound is an ever so soft Asian instrumental tune which plays gently in the background. The wealth of this slot is not only in its theme, artwork or prizes. It is also in its features starting with the wild pearl which can surface on the 2nd, 3rd, 4th or 5th reels. It has the raw ability to also appear as a 3×4 sized giant symbol. This precious symbol can substitute for any symbol except the gong scatter. A signature feature of this slot is the ability of all the upper-value and lower-value symbols to appear in different sizes. So, in addition to symbols that occupy a single space, there is also the possibility of 3×2, 3×3, 3×4 or 3×5 sized symbols when the reels lock together. The Scatter Gong Feature is a five free spins game which is triggered by a minimum of 3 consecutive scatter gong symbols. The number of scatters triggering the feature is important because it will also determine the amount of synchronised reels. In other words, 3, 4 or 5 scatter symbols will lock 3, 4 or 5 reels together. 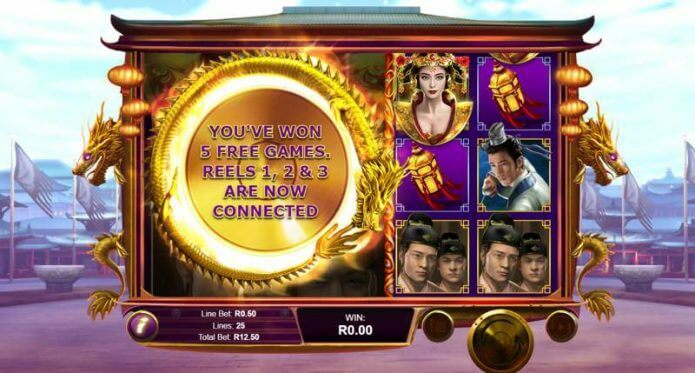 Wu Zetian slot is a 5-reels and 25 fixed paylines slot which can be played with wagers of as little as R0.25 to as much as R125. It does have higher volatility meaning you might need a higher bankroll to play longer. Five thousand years of Chinese history lends itself to the creation of this early 2019 release which is sure to captivate you with its beauty, features and prizes! Players who are serious about their slot games will find that this one goes anywhere with them on mobile or tablet. All you need is an Android or iOS. Game description: Five thousand years of Chinese history lends itself to the creation of this early 2019 release which is sure to captivate you with its beauty, features and prizes!